I'm always on the lookout for creative shower ideas that aren't cheesy and that interest everyone. 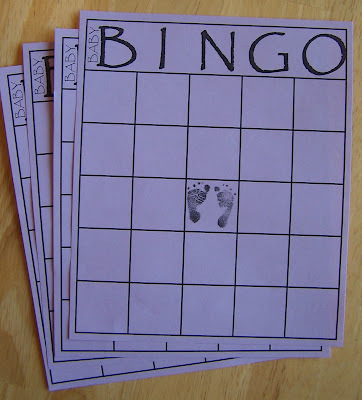 I found some Baby Bingo cards online a few years ago and decided to adapt the game and have used it at several showers I've thrown. It is always fun for everyone and keeps people paying attention while the mother to be is opening gifts. 1. Print out the blank cards on colored card stock. I usually change the middle image to fit the theme of the particular shower. 3. Once everyone fills in their card play "Bingo" as the gifts are opened and give out prizes along the way. Like I said, everyone enjoys this and it keeps the focus on the mom to be since they are paying attention to every gift she opens. You can click here to download the template I created of this particular card. It will print two per page. If we play another trivia game or something I usually print that answer sheet on the other side of the card. theres no way im giving my credit card info. nuuuuupe!